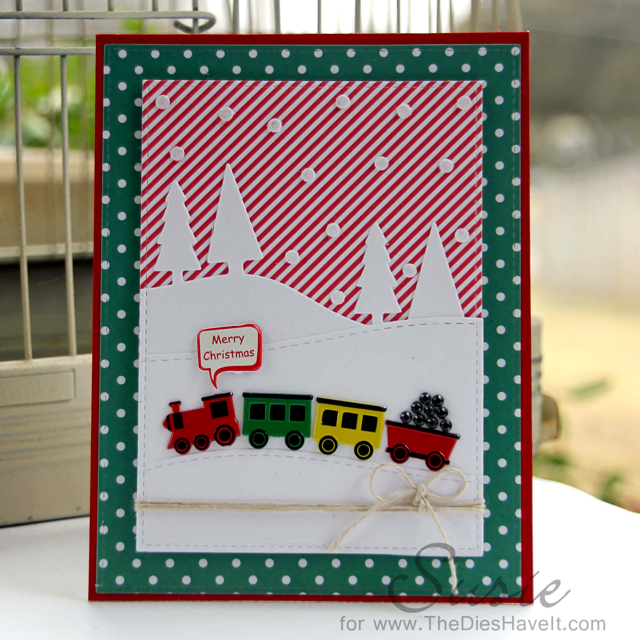 I just got these train and holiday saying bubble brads from Eyelet Outlet and I couldn't wait to use them on a card. I built up my winter scene using dies from both MFT Stamps and Simon Says Stamp. Then I went old school and punched a bunch of white circles for the snow. I lined up all of my train cars and attached them to the lowest hill. Then I added the MERRY Christmas saying bubble brad. Before I adhered my panel to my card front, I added some Eyelet Outlet bling (for coal) and some twine for the bow. It took me a few tries to get this card the way I wanted it, but I have to say, I pretty much love it! Be sure to check out all the brads and bling (and flowers and Washi tape and ribbon) from Eyelet Outlet. It's a super cool site with plenty of inspiration too. And speaking of inspiration, check out the Eyelet Outlet Blog. This week there will be plenty of holiday inspiration to enjoy.